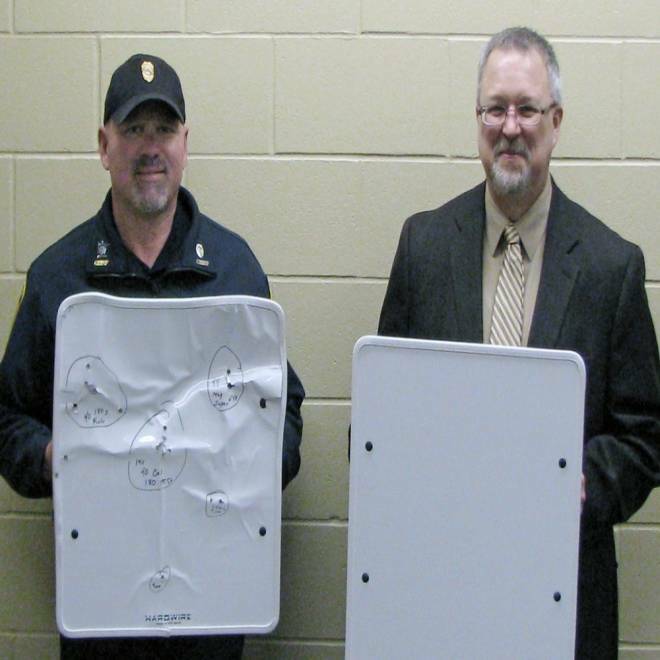 Cold Spring Police Chief Phil Jones, left, and Rocori School District Superintendent Scott Staska hold bulletproof white boards in Cold Spring, Minn., on April 22. Rocori schools are among the first in the nation to acquire the kevlar whiteboards which can be flipped quickly to provide some protection for teachers and students in the event of a shooting. COLD SPRING, Minn. — A Minnesota school district where two students were killed in a 2003 shooting unveiled a new device Tuesday aimed at adding a last-ditch layer of safety for teachers and students: bulletproof whiteboards. The Rocori School District has acquired nearly 200 of the whiteboards, made of a material touted by its manufacturer as stronger than that in police-issue bulletproof vests. The 18-by-20-inch whiteboards can be used by teachers for instruction and used as a shield in an emergency. Police Chief Phil Jones demonstrated the whiteboards Tuesday in a school gym by leveling a karate kick at one, whacking it with a police baton and stabbing it with a knife — all with no apparent effect. Jones didn't fire his gun at the whiteboard, saying it would have been unsafe and inappropriate at the school. But he said he'd tested it earlier by firing several rounds at it. "We put this board to the test, and quite frankly, that was the day I became a believer," Jones said. The manufacturer, Maryland-based Hardwire LLC, has been working on armor protection devices for military vehicles and personnel for years. The company turned its attention to school security after the Connecticut elementary school shootings in December that killed 20 children and six educators. Company officials said the whiteboards are already in schools in North Dakota and Maryland, and are being rolled out in Pennsylvania and California. Jones said Rocori schools are the first to use them in Minnesota. At least one security expert questioned whether the boards would be effective. Bill Nesbitt, president of school security consulting firm Security Management Services International, wasn't familiar with the whiteboards but said his initial reaction was that they may provide a false sense of security. The prudent thing to do would be to retreat from danger rather than hide behind a whiteboard, he said. Jones and Scott Staska, the Rocori superintendent, noted that the boards are a supplement to a broad plan that includes lockdown drills and school resource officers. In 2003, a 15-year-old boy brought a gun to Rocori High School and fatally shot 14-year-old Seth Bartell and 17-year-old Aaron Rollins. The gunman, who is serving a life sentence, was convinced by a teacher to put the gun down.Rollins' father, Tom Rollins, said he doesn't believe the whiteboards would have saved Aaron or Seth. But he said it's a good idea, adding that if the teen gunman had decided to keep shooting, such a board may have helped other students. "He still had seven more shells in his gun, so who knows what would've happened," Rollins said.